PDA #74 out of 1,200 entries. And we’re among good company. Pretty good for our first time on this list. 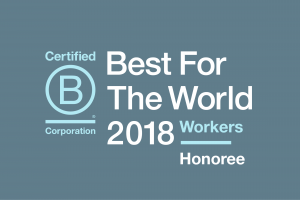 PDA is proud to be honored among the Best for Workers for the 2nd consecutive year. See more at BtheChange.com. Thanks to our robust Wellness Program, PDA is recognized as one of Oregon’s Healthiest Employers – 4 years in a row! Read this year’s story. Kaiser Permanente Dental has been continuously accredited by the Accreditation Association for Ambulatory Health Care (AAAHC) since 1990. This accreditation signifies that Kaiser Permanente Dental has passed rigorous national standards for the provision of quality dental care. PDA’s Executive Dental Director and Dental Directors are sought-after presenters at national and international dental conferences. Recent presentations have focused on the success PDA has experienced in applying evidence based principles to daily clinical practice and in promoting medical-dental integration. Whether you call it “whole health” or “Total Health,” PDA’s philosophy of integrated care to achieve overall wellness was the subject of an ADA study. Congratulations to Dan Pihlstrom, DDS and PDA for making the cover of January’s Journal of the American Dental Association. The article co-authored by Dr. Pihlstrom makes observations that reveal that PDA dentists, female practitioners, and older dentists are more likely to follow evidence based practices. 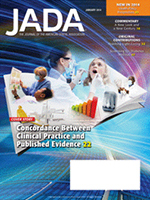 This is the second article published in JADA by PDA dentists. 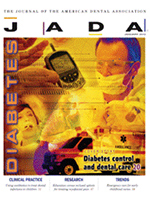 The first article titled, “Diabetes Control and Dental Care” was published in January 2012. Jody Callaghan, DMD was recently awarded the David Lawrence Award. The David Lawrence Community Service Award is a KP National award named in honor of Dr. David Laurence, former CEO of Kaiser Permanente and lifelong advocate and champion of improving community health. The awards recognize groups and individuals dedicated to improving the health of our communities. Dr. Callaghan was selected from among 250 nominees across all KP regions, among 50 finalists and is among 18 award recipients. She is the only NW representative to receive David Laurence award this year. Selection criteria includes: Exemplary efforts, Significant history of sustained contributions to the overall health of a community or population, Measurable impact on the health or well-being of a community or population, Commitment to important health and social issues, Collaboration with a community organization, and Understanding of racial and ethnic disparities in health care. 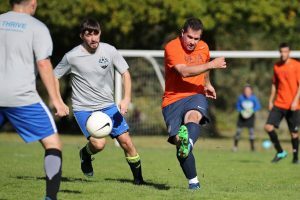 Dr. Callaghan organizes outreach to uninsured and vulnerable people through events such as KP Night Out and Give Kids a Smile, and promotes the Oregon Dental Association’s Mission of Mercy. 91 PDA dentists are members in the National Dentist Practice-Based Research Network (The Nation’s Network). The Network is a consortium of participating practices and dental organizations that investigates research questions and shares experiences and expertise. The nation’s network is an effort to help dental professionals directly improve the efficiency and effectiveness of dental care. Essentially, it is research done about and in the “real world” of daily clinical practice.